To test for ECU codes, you need to gain access to the ECU itself. 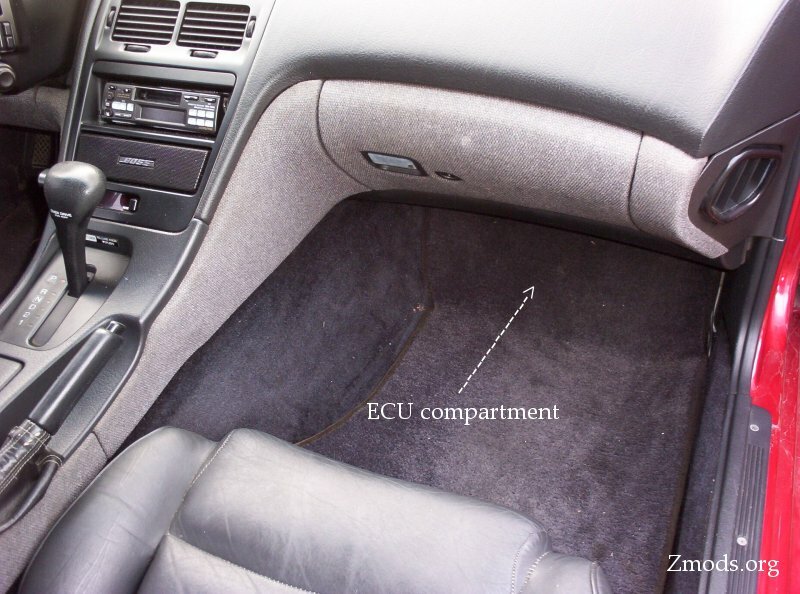 It's located under the false floor in the passenger side floorboard. Follow the steps below to gain access to the ECU. 1) Remove the passenger floor mat. 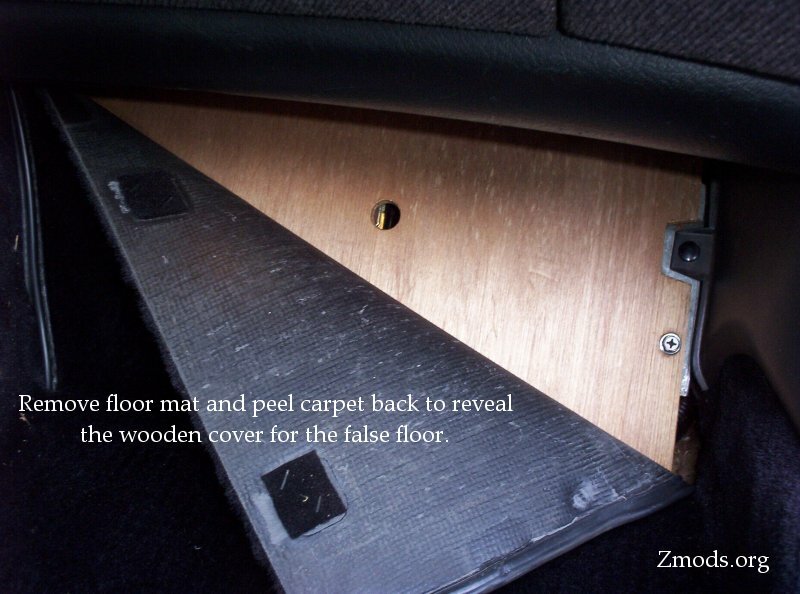 2) Peel the carpet back, it's only attached with Velcro. 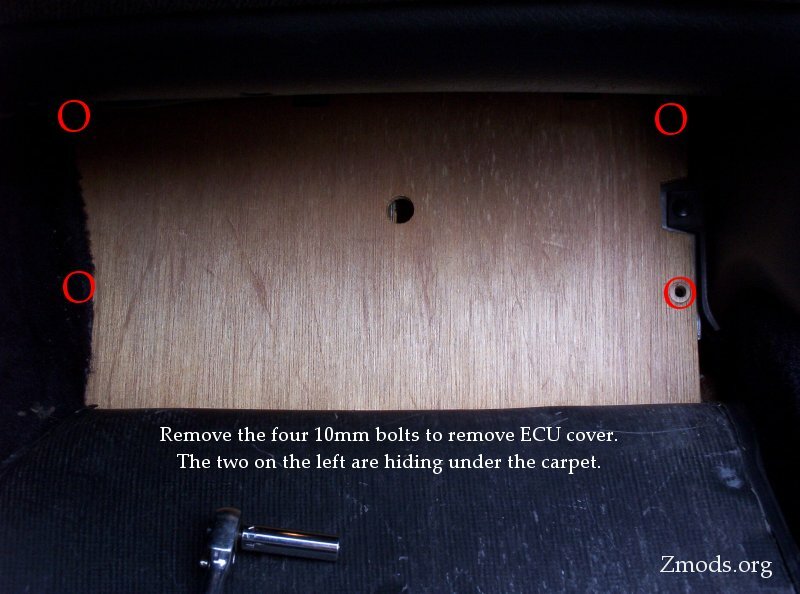 3) Remove the wooden false floor, it's held in place with 4x 10mm bolts. 4) On the side of the ECU there's potentiometer. 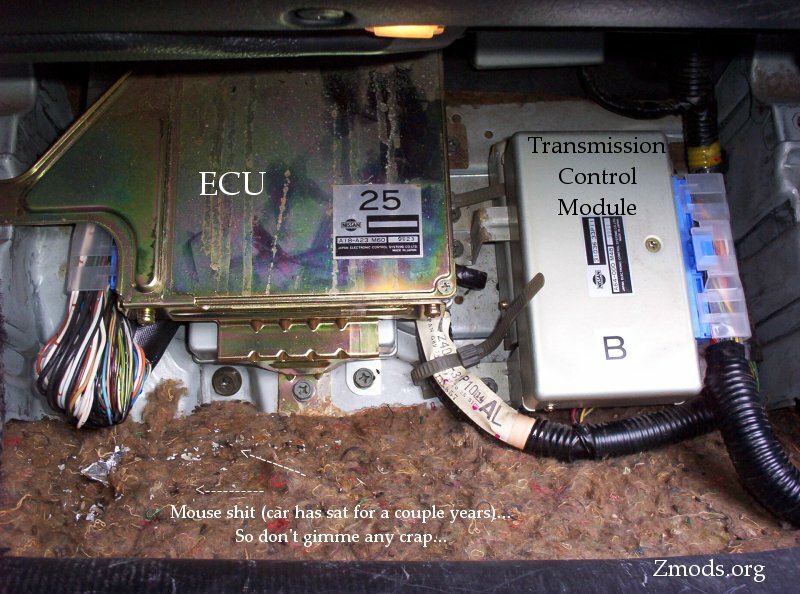 On a Z with an automatic transmission, you have to take the transmission control module loose to gain easy access to the potentiometer. 5) Turn the ignition switch on, but do not start the engine. 6) Turn potentiometer (diagnostic mode selector) fully clockwise. Wait at 2-3 seconds, then turn potentiometer fully counter clock-wise. The ECU is now in Diagnostics MODE II Diagnostics. 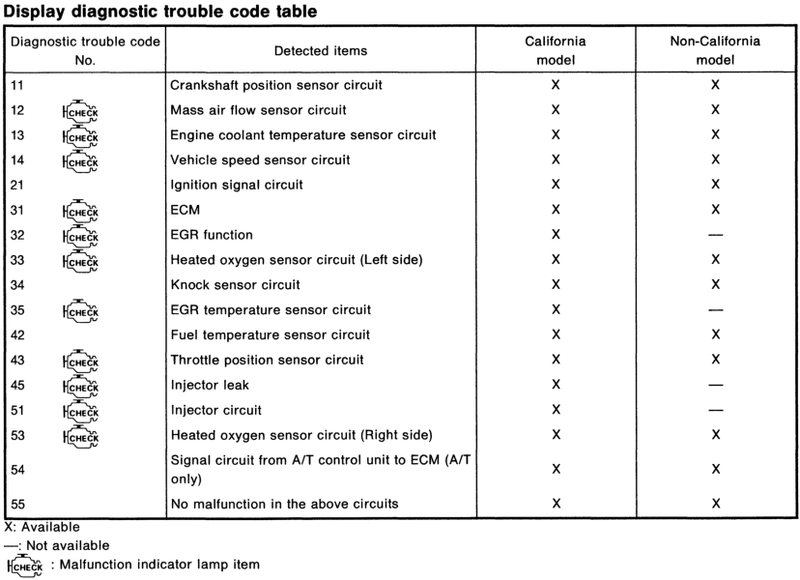 7) Read the codes from the flashing LED on the side of the ECU or the check engine light itself. Long flash is first digit, short flash is 2nd digit, the codes are at the bottom of this page. 8) To exit MODE II Diagnostics, turn potentiometer fully clock-wise. Wait at 2-3 seconds, then turn the potentiometer fully counter clock-wise. 1) Start engine with the ECU in MODE II . The ECU is now monitoring the left O2 sensor. Warm the engine to normal operating temperature, then run at 2000 rpm for 2 minutes. Check that the LED blinks (or the check engine light) more than 5 times every 10 seconds at 2000 rpm. 2) To change to right sensor turn the ECU potentiometer clockwise with engine still running, wait 2 seconds, turn it back. Check the lights at 2000 rpm again for a similar switching condition. 3) To exit MODE II - Heated Oxygen Sensor Monitor, turn the potentiometer fully counter clock-wise and stop the engine. 55: No fault found, everything is hunky dory! Camshaft Angle Sensor circuit (CAS) Either 1° or 120° signal is not entered for the first few seconds of engine cranking.